So I misplaced my wedding rings last week. And then I found them. After I stopped looking for them. I hate it when I lose things like that (I have a BAD habit of taking off my rings to put lotion on my hands…) but I mean, what’re you gonna do? The white gold band with the 3 diamonds (on the left above) was my mother’s. She has been gone for 30 years–it is NOT replaceable. The only thing I knew to do was retrace my steps, drive back to my school classroom twice and interrogate the janitor, ahem, inform him of my loss. Go back and interrogate (inform) the folks at Starbuck’s where I’d gone between work and home…. and retrace my steps. Again. But nothing. I finally had to go to bed with naked fingers and trust (convince myself?) Jesus loved me and He knew where my rings were. The next morning I woke up with this loss on my mind, but I also had another thought swimming through my head. My son had texted me the morning before to tell us that dear, lifelong friends of ours had been interviewed on the national news as survivors of being swept away in a flash flood in Nevada. Their lives were saved in a miraculous fashion–I saw the video (maybe you did, too?) Someone with a cel phone captured pictures that took my breath away. Torrents of rain were roaring across the highway they were traveling on. Within seconds their van careened BACKWARDS as L. tried to quickly turn to avoid the current. In an instant, they went down a waterfall of water and mud to a wash below them. My friend M. was swept away because the current was too strong; she couldn’t hold on to the door of the van any longer. Her husband L. hung onto the rack on the top of the vehicle and was rescued by policemen and a few Good Samaritans after floating down the wash.
Their interview the day after the trauma clearly indicated they were shaken. M. gave God credit for their rescue and shared openly about her prayers, “Help me, Jesus, help me, Jesus,” while bobbing up and down in the current of swirling water. L. broke down in tears as he shared how overcome he was to find out his wife was okay. After I spent some time in prayer with these two big things on my mind–lost wedding rings and found people–the Holy Spirit helped me adjust my perspective a little bit. The devotional word I read that morning was about ‘Finding the Unlooked For Things.’ (Andrew Murray). Two things occurred in this quiet time at my desk--my perspective shifted about what really was important–losing some jewelry versus losing your life–and I was also encouraged by God’s sense of humor. He DOES know what’s going on with me; I can trust Him with my losses, however small. It was this frame of mind which dominated my thoughts as I dialed M. and L.’s number in the Central California city where they’ve lived the 35 years I’ve known them. My heart rejoiced as L. answered the phone. When I asked to speak to his wife, well, it was all I could do to not weep. I listened intently. Details unfolded about the enormity of what they had experienced. They were on the first day of a 4 week trip they had planned to take across the United States, visiting their family and friends from California to Maine. The van was packed with trail bikes, golf clubs, camping gear, everything they would need for the trip of a lifetime. And they almost lost it all. Their van–brand spanking–new-vinyl-smell-new–was a total loss, their golf clubs were badly bent, expensive trail bikes dented and crushed. Their clothes had all washed away in the instant they were swept through the water, cel phones gone, M.’s purse gone. They salvaged some things but were grateful to God to escape with their lives. 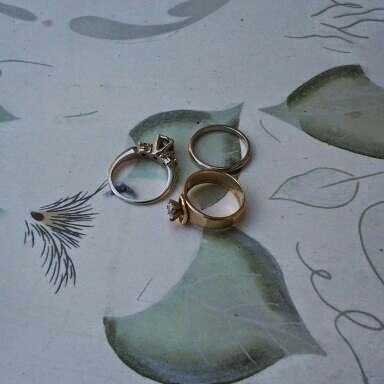 As I shared about the absent-minded loss of my wedding rings, she sympathized as if they had been her own. “I hate it when I do that,” she chuckled. I told her she was sweet to say so, but pointed out that my perspective about what was really important had shifted 180 degrees in less than 24 hours. Misplacing my wedding rings kind of paled in comparison to what she had just experienced. She’d almost lost her LIFE. What really matters? God knows our bikes and our golf clubs and our cars and our jewelry make us happy and He is pleased that we enjoy all that…. but it’s just stuff. People are what’s important–my precious friends, worth more than their weight in gold, almost lost and miraculously found because of God’s great love. Kind of like my wedding rings. Linking with the tribe over at Soli Deo Gloria--more wonderful voices over there. Last week, my friend, Amy taught my bible study class because she wanted to take some work off my plate. She was teaching on John 6 and related perspective to why so many people could not understand His teaching. It really helps to allow God to come in and set things up in a different way so we can see what really does matter. Ahhhh, a kindred spirit. We are all lost and found and lost and found again, eh? Ah, well put. Thank you for reading, Heather. I am convinced, Jody, that it is all about perspective. We can feel rich or poor, blessed or forsaken, lost or found, depending on our perspective. Thank you for that reminder today! So much truth here, Jody. And I'm notorious not only for losing things, but for “putting them somewhere special” so I won't lose them, then forgetting where that special place is! Lost and found, I love those themes and so often we, in our limited perspective, confuse the two. Such a meaningful post, Jody. Thank you for sharpening our perspective along with your own. So where WERE your wedding rings? !